UPDATE: The price on these has gone up now so that they are ABOVE the $300 mark. Unfortunately, this has degraded our overall opinion of these swords and as a result they have been pushed down from a 3 star to a 2 star rating.. 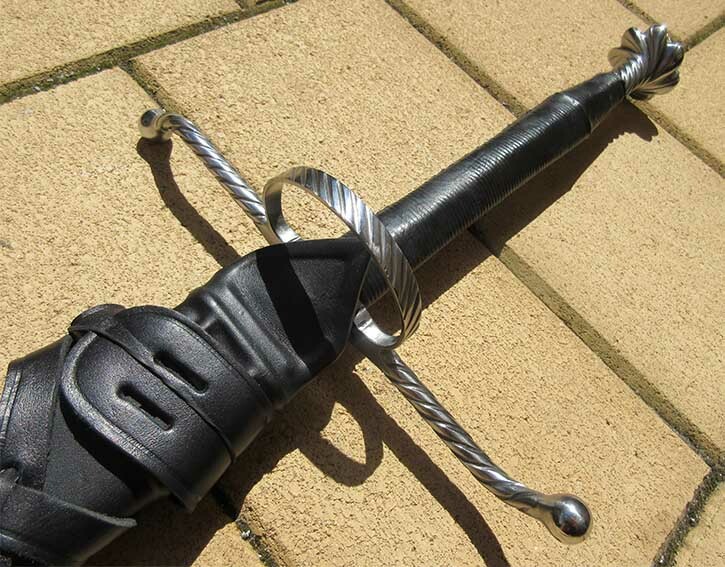 The Herald Series are a sub $300 line of medieval swords made in India under the direction and to the specifications of Darksword Armory. In many ways, these swords are a return to the style of their earliest model swords, though take advantage of the refinements made over the years to create much more attractive, more historically accurate fully functional replicas. 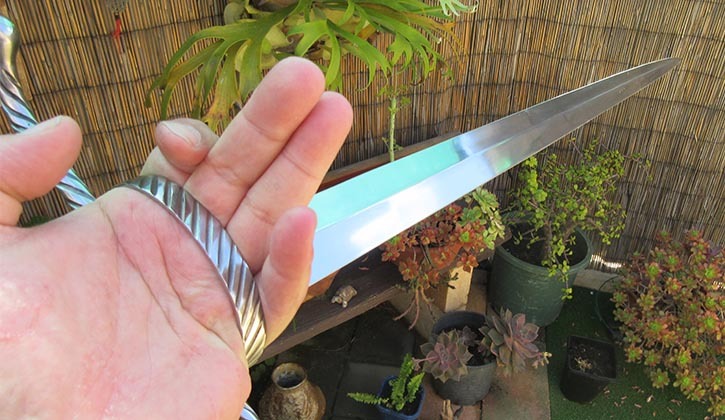 In this hands on review, we will take a close look at one of the swords from the Herald Series line up - their big, mean looking two handed sword - and see how this sword stacks up compared to other Indian made swords in this price range and Darkswords own, earlier models. At first it was a bit difficult to see what I had actually received, as like their more expensive, Canadian made lines, the sword was heavily 'mummified' in cling wrap - taking a good 20 mins to carefully remove all the plastic without accidentally scratching the blade or cutting the leather scabbard. Finally, the sword revealed itself - and I must admit, visually it is quite an impressive piece. Mine came with the upgraded scabbard option which costs an additional $80 and as it is made by Darksword in their Canadian workshop, it is exactly the same as any other Deluxe option scabbard they offer. That is to say - the basic model comes with a simple, unadorned wood core, leather lined scabbard. But for $80 extra you get an intricate leather belt and suspension system (as well on instructions on how to wear it, as it is not exactly intuitive). Considering the versatility that comes with the ability to wear the sword to Renaissance festivals, Gen-Cons, Halloween parties, etc - and how much better it looks when wall mounted with the belt entwined - it is a good optional extra and probably worth the extra dollars if you can swing it, though not necessary. 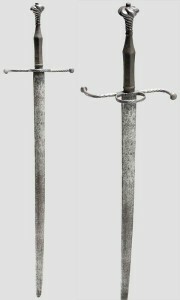 The hilt of the Herald Series Two Handed Sword is based on a German 16th century sword currently on display in the Landesmuseum, Zurich. For the most part it is a fairly accurate replica - probably the only significant point of departure is the original has a partially waisted grip, while the Herald Series version follows it to some degree, but is not as pronounced. Have a look at the picture below and you will see what I mean. Overall though, it is a good approximation - out of the box the mild steel assembly feels quite sturdy and is well put together, save for a few minor cosmetic flaws here and there. It passed the magnet test, so was proper steel - not stainless or zinc aluminum. While the writhen quillions and side ring are attractive enough, the pommel is probably the best executed - the only issue is that I do not like the way the leather wrap protrudes over it slightly and it could have been executed a little crisper. 1) To protect the hand and augment the guard against incoming strikes. 2) To allow it to be gripped for half swording and to provide more power and control when thrusting. Overall - the fittings are done well. They are close to the historical original, sturdily made and apart from some minor cosmetic issues here and there, are well put together. 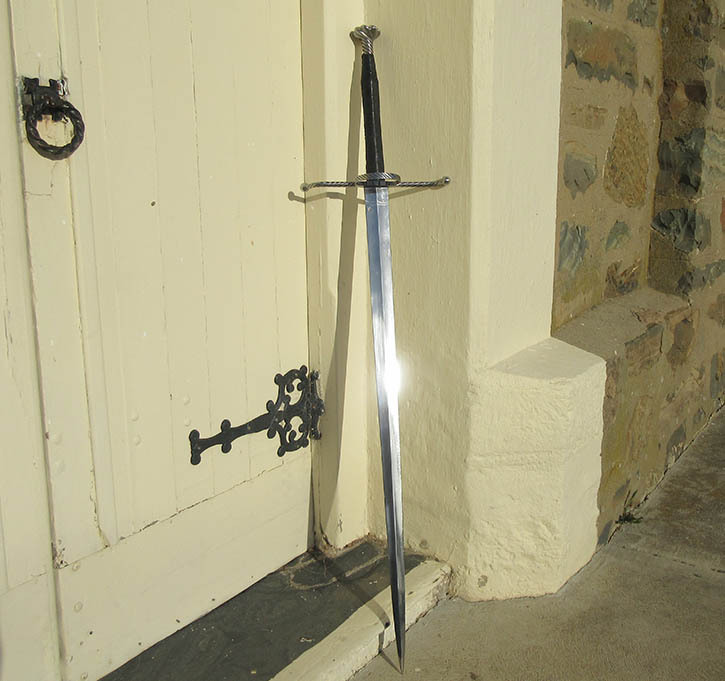 The blade itself is 33" long and hand forged from EN45 carbon steel, a very durable and flexible strong steel with many of the properties of 9260 Spring Steel. 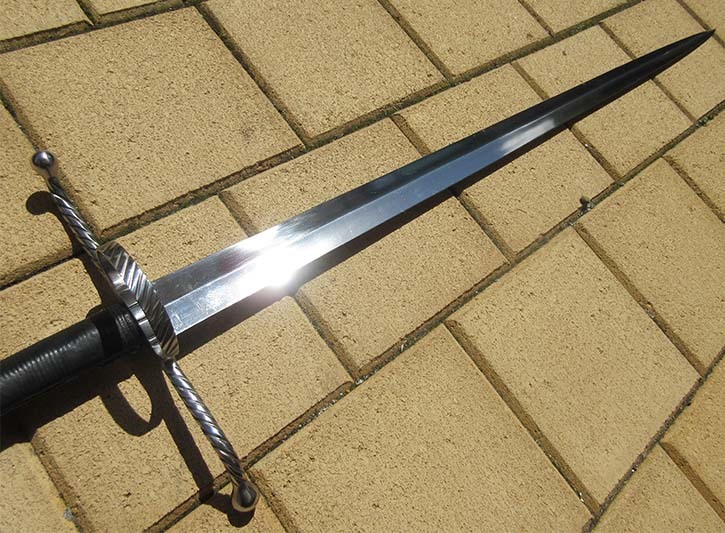 Include the 16" inch two handed grip hilt and pommel and you have a whopping 49" of sword for under $300, which is pretty good value right then and there. The polish of the steel is a little satiny and imperfect - I would not say it is 100% mirror polished, but it IS hammered and ground into shape the old fashioned way and it is clear that a lot of man hours have gone into creating it from a lump of steel.. The sword comes with a dull edge. I have found that the sharpening service Darksword offers is not what most sword enthusiasts like or expect when they pay an additional $30, so left it dull to sharpen at a later time. Even in this unsharpened state, the sheer weight and power of the blade would cause a pretty lethal wound, especially if one was to leverage the side ring and thrust with it..
As such, I would not recommend this sword for sparring practice unless you were armored, very experienced and very careful.. One slip or moment of inattention and you might get a more authentic medieval experience than what you would hope for.. This is clearly a two handed sword, and needs both hands to be effective. I am not 100% certain of the weight as I did not have any way to weight it at the time of testing - however I would estimate its weight to be approximately 3lbs 12oz or so. Despite being quite heavy, it is very well balanced - with a point of balance only 5" from the cross guard. While not fast, it has some serious blade presence and makes a very satisfying 'woosh' sound when it cleaves the air. I would not want to be on the wrong end of this blade, that is for sure. The first test was the ubiquitous flex test. 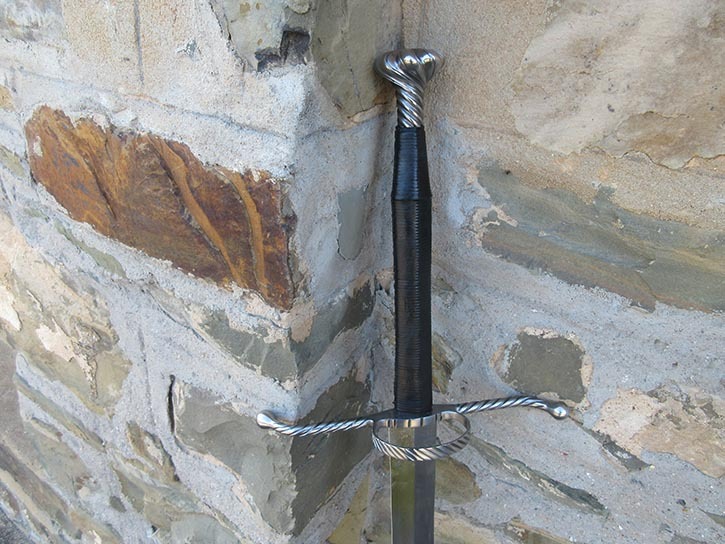 Flex testing is extremely important for medieval style swords as unlike, for example, traditional Katana - a medieval sword needs to flex a lot when it hits a target and return to true. It needs to be both strong yet supple to survive the rigours of combat - and as you can see from the test below, it has a nice amount of springiness to it. In the test video, you can plainly see the hammer marks from when it was forged. You can also see that it is does not seem to sit perfectly straight. This is pretty common on hand forged swords, and while it will bother some people, it is actually fairly common on antiques as well. You don't find this when you CNC lathe a sword of course, but to me - as long as it is only a slight deviation from 'laser straight' it is not a problem. 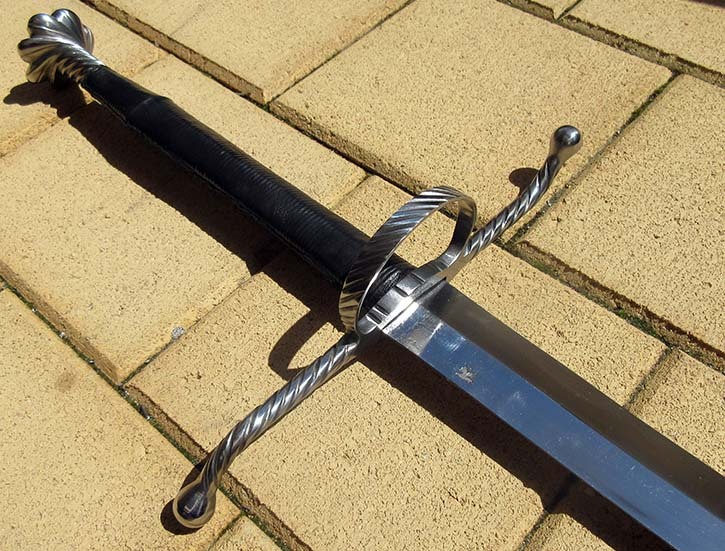 If you think it is something that will bother you, it is best to avoid hand made swords in general (especially lower priced ones like the Herald Series). Anyway, as it was unsharpened - cutting water bottles and light targets was out of the question. Instead, I opted to take on a cardboard box and a wooden post/pell staked firmly into the ground. The box was made short work of. And the pell was chipped and chopped up from each authoritative, fight ending strike. Now this is very abusive testing, mostly to test the resilience of the blade. The blade was fine. But the hilt assembly, despite being peened, did loosen slightly.. This is not a complete shock, most serious HEMA (Historical European Martial Arts) practitioners warn that a wooden pell like this is only suitable for practice with a wooden sword as the shock-waves will travel into the hilt and push it beyond the limits it was designed for (after all, a shield or an armored opponent WILL give somewhat when struck, while a post is - unless you are Don Quixote - not going to be your usual battlefield target).. However, the Darksword Sovereign sword - albeit much lighter - had a hilt that could survive the same tests without any looseness whatsoever. As such, I think it may be a minor weak point at the extreme end of testing for the Herald Series line. The blades are much stronger than the fittings and does let them down comparatively. I have some mixed feelings on the Herald Series two handed sword. With the upgraded scabbard and ornate fittings, appearance wise it does stand a little higher than your typical Indian made swords like those from Windlass Steelcrafts. Out of the box, the overall construction is better - and the EN45 blades are super tough and flexible. Indeed, they well exceed the strength and durability of the fittings, and this - plus minor cosmetic issues and the fact that if you want it sharp for cutting practice, you really need to do it yourself, do let it down somewhat. For the sub $300 price point, they are decent value - but personally, I still prefer Windlass Steelcrafts for the better balance between hilt strength and blade durability. In short, the Herald Series is a bit out of whack with what seems like super strong blades in fittings that cannot let them achieve their maximum potential. While it is still a pretty decent buy, I do not feel they compare favorably to the lower priced Windlass Steelcrafts swords or the higher priced Darksword Armory models. Extremely strong, beautifully tempered EN45 carbon steel blade. 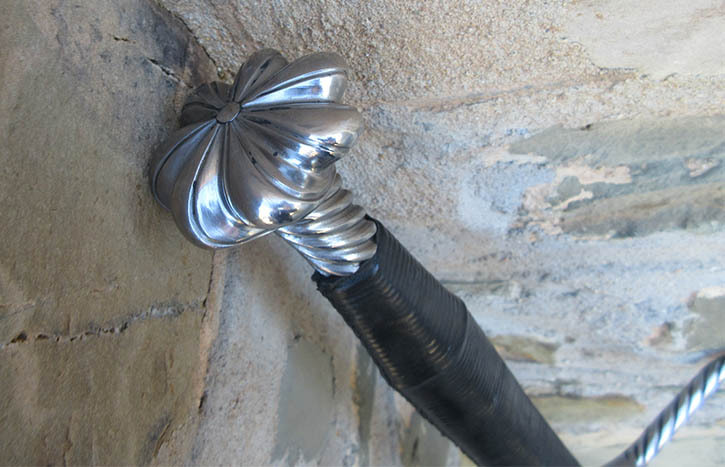 Mild Steel, magnetic fittings. Good fit and finish. Very attractive, historically accurate design. Decent handling - prominent wooshing sound when it cuts the air. Forceful blows. Minor cosmetic issues on both blade and fittings. Imperfect leatherwork on the hilt (feels a little 'rushed') and scratches, imperfections on the blade. Some hammermarks and slight curve to the blade. Some people don't mind this as it does not effect functionality. Others can't stand it, so best forewarned not to expect "perfection". Blade is too strong for the fittings and does not allow it to reach its full potential. Price rise from $275 to now $325 and over $400 for the one with the scabbard as we got it has pushed its overall value down in my opinion, and has caused it to drop from a 3 star to a 2 star rating.. 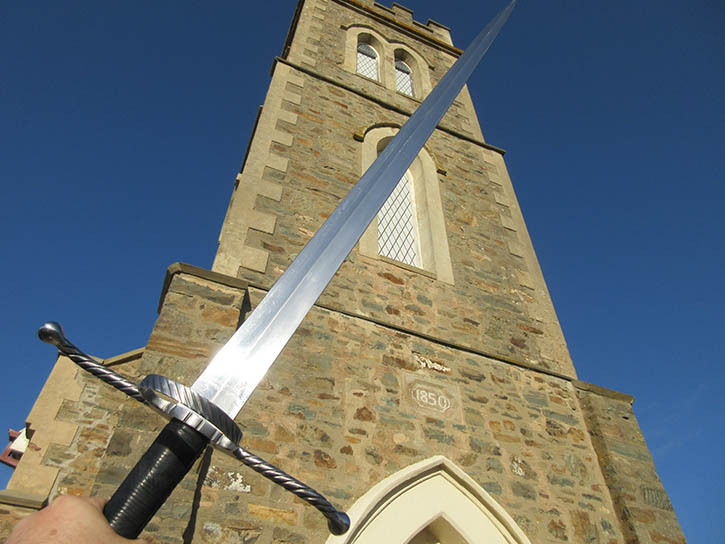 In summary, I think it is not a bad sword - and the blade is excellent - but it is in our opinion a bit overpriced and the lack of hilt integrity makes it hard for us to recommend that you go out of your way to purchase it. Would make a good project piece or for strength building. 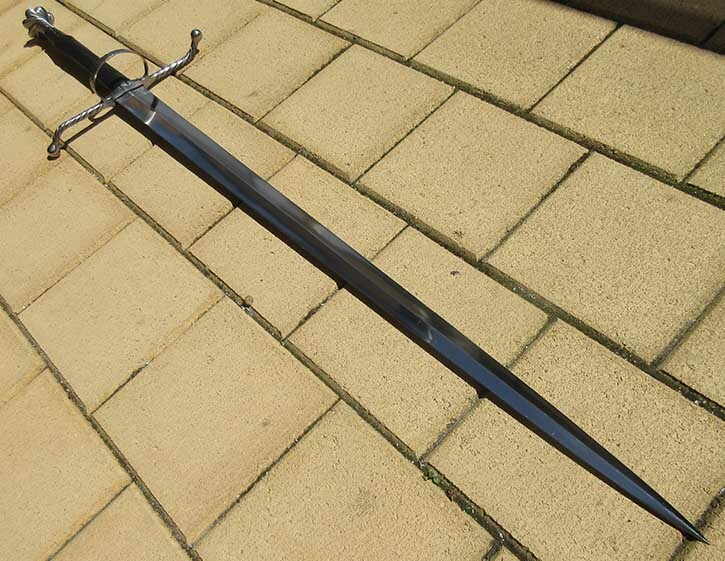 At the moment this sword is exclusively available on the Darksword Armory website here for $325 for the basic version, and $405 to get the same package we got, which we feel is a bit too expensive for what you get..